The Ivor Novello Trophy for best TV Theme in 1971 for "Who Do You Think You're Kidding Mr Hitler". The Writer's Guild Of Great Britain award for Best Comedy Script 1969, 1970 and 1971. 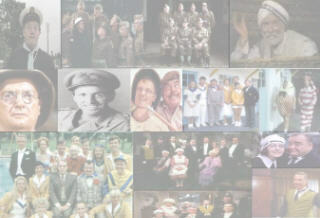 BAFTA _ Best TV Episode 1971 for Dads Army. 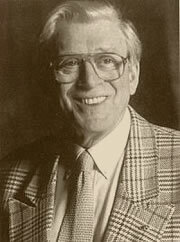 He was awarded the OBE in 1978. Dads Army : 80 episodes co-written with David Croft OBE, see Series Guide. Dads Army : Christmas Night With The Stars, 4 Dads Army sketches co-written with David Croft and shown as follows: "Dads Army" 25/12/1968, "Resisting The Aggressor Through The Ages" 25/12/1969, "The Cornish Floral Dance" 25/12/1970 and "Broadcast To The Empire" 25/12/1972. The Gnomes Of Dulwich : written by Jimmy Perry alone, this BBC comedy ran for 6 episodes, from May to June 1969, and starred Terry Scott and Hugh Lloyd as 2 gnomes who live in a garden. it also featured Frank Williams and Colin Bean of Dads Army fame. Royal Television Gala Performance : Another Dads Army Sketch, this time written solo, entitled Guarding Buckingham Palace, broadcast 24 May 1970, the platoon are tasked with the job of guarding the Palace on the 1st anniversary of the home guard. Performed in front of HM Queen Elizabeth II and HRH Prince Philip, The Duke Of Edinburgh. Wiltons, The Handsomest Hall In Town : a solo project for the BBC, a 45 minute one off special, tribute to the famous Wilton's Music Hall. It starred Spike Milligan, Peter Sellers, Bill Fraser, Warren Mitchell and Ronnie Barker. Broadcast 26/12/1970 on BBC 2. Lollipop Loves Loves Mr Mole : A solo project for ATV, starring Peggy Mount, Hugh Lloyd and Pat Coombs. Aired in Oct/Nov 1971 it was about a couple, Reg and Maggie Robinson (Lloyd and Mount) who are landed with in-laws who have returned from abroad. This was followed by a special as part of the Mike and Bernie Winters All Star Christmas Comedy Carnival. Lollypop : a second series of the above, but with a shortened title, from 1972. Again written alone. This and the previous series also featured turns from Michael Bates, Michael Knowles, Bill Pertwee and John Clegg all of whom had roles in Dads Army and It Ain't Half Hot Mum. Blue Peter (Sketch) : A short sketch written with David Croft, and starring Arthur Lowe and John Le Mesurier in their Dads Army role. Mainwaring and Wilson inspect a painting sent to Blue Peter. Shown February 1973. The Rear Guard : Jimmy and David wrote a pilot for ABC TV in America based on Dads Army. Adapted by Arthur Julien. Shown in 1975, it wasn't a big success. Royal Variety Performance 1975 : a sketch adapted from the stage version of Dads Army called The Choir Practice. Written with David Croft and performed at the London Palladium on 10 November. It Ain't Half Hot Mum : 56 episodes co written with David Croft, see Series Guide. The Old Boy Network : A lot of well known comedy actors look back on their lives and careers and Jimmy wrote some material for them. Shown on the BBC, the performers included Eric Sykes, Spike Milligan, Bill Maynard and John Laurie. Room Service : a solo work, this was an unsuccessful series for Thames TV shown in 1979, starring Bryan Pringle and Matthew Kelly. Only 1 series was made. Hi-De-Hi! : 58 episodes co-written with David Croft for the BBC, see Series Guide. You Rang M'Lord? : 26 episodes Co- written with David Croft for BBC, see Series Guide. High Street Blues : a very unsuccessful sitcom co-written with Robin Carr, shown in 1989 for LWT. It was a about a small row of shops under threat from a supermarket chain. Dads Army : this ran in London for six months in 1975 and then toured England for 5 months in 1976. It starred all the usual stars from the show but had the following, John Bardon played Walker, Hamish Roughead was Fraser and Jack Haig played Jones, when Clive Dunn left the tour. Co-wrote with David Croft. 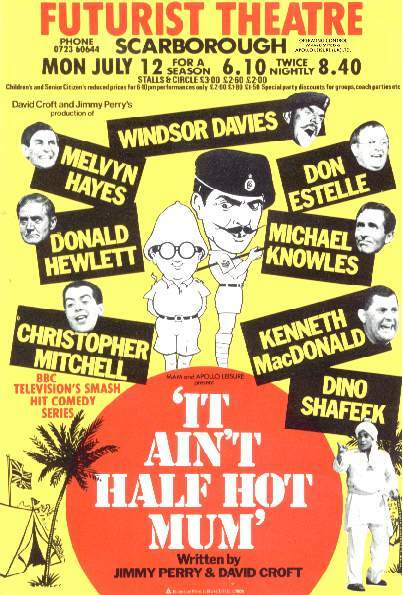 It Ain't Half Hot Mum : again co-written with David Croft, this was a stage version of the TV series starring Windsor Davies, Melvyn Hayes, Donald Hewlett, Michael Knowles, Christopher Mitchell, Don Estelle, Kenneth Macdonald and Dino Shafeek. It first ran at Bournemouth in 1979 and then in 1982 at Scarborough, as well doing a tour of British Theatres. Hi-De-Hi! : Another spin-off from the TV series, co-written with David Croft, it starred most of the regulars including Simon Cadell, Paul Shane, Ruth Madoc, Su Pollard, Felix Bowness, Barry Howard and Jeffrey Holland. It toured during 1984 and was also at the Victoria Palace Theatre, London. Michael Knowles took over the role of Jeffrey Fairbrother after Simon Cadell left. Hi-De-Hi Spirits : Co-written with David. This play was about some of the Hi-De-Hi regulars setting up a boarding house. It starred Paul Shane, Ruth Madoc, David Griffin and Linda Regan and ran at Bournemouth. That's Showbiz! : This play traces the life and career of a stage comedian. Written by Jimmy, it starred Ted Rogers, Su Pollard, Carmen Silvera and Peter Baldwin and ran from 3rd to 8th November 1997 at the Richmond Theatre.